But new findings from the “Nurses’ Health Study,” conducted by Harvard Medical School, show that women especially can benefit from walking, and even from standing and walking around at home instead of sitting. This large study of women and health also offers some information about what helped women choose and stick with walking for exercise. Researchers found that women who lived in safe areas with neighbors close by were more likely to walk. But even if you do not live where you can easily or safely walk, you can walk around the inside of your house, on a treadmill or in a mall. You can also ask a family member or a neighbor to walk with you. Or, take a walk on your lunch break with a co-worker. Walking is an activity that most people can do, and it can add to both the length and quality of your life. 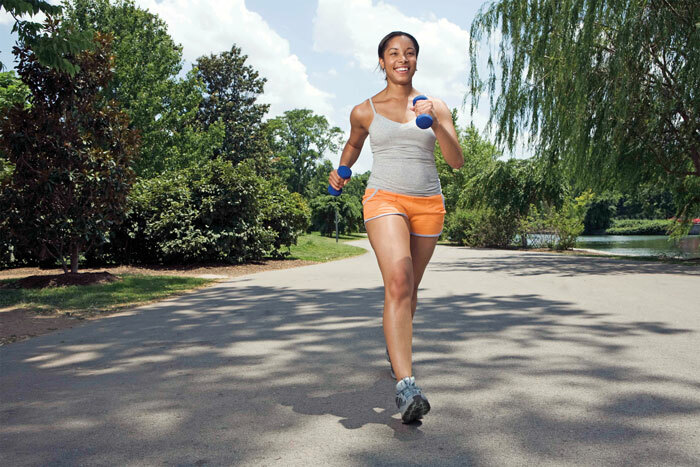 Start with 10 to 15 minutes and try to walk faster and for a longer amount of time each week. Did you know that walking lowers both blood glucose and insulin resistance? The Nurses’ Health Study showed that walking briskly for 30 minutes each day lowers the risk of diabetes by 30 percent. Standing or walking around the house for two hours a day lowered the risk for diabetes by 12 percent and obesity by 9 percent. And walking for one hour each day lowers the risk of obesity by 24 percent. On the other hand, sitting at work, driving or watching TV for long periods raised the risk for type 2 diabetes. Women with type 2 diabetes who exercised, including brisk walking for more than 4 hours per week, had about a 40 percent lower risk of heart disease. Women who walked faster had less risk. This means that walking helps to prevent heart disease, which is the leading cause of death among people with diabetes. This study defined healthy aging as long life combined with good memory, good physical ability, good mental health and no major chronic diseases. Women who were part of this study who walked for 90 minutes each week maintained their memory over time better than those who did not. They also increased their chances of healthy aging by about 15 to 20 percent. Women who walked for five hours per week had a 9 percent lower risk of breast cancer compared with women who did not exercise. In addition, women who walked three to five hours per week after they were diagnosed with breast cancer were at a 50 percent lower risk of death from their disease. Women who walked more than one hour per week had about a 30 percent lower risk for colon cancer. Women who walked at least five hours per week had about a 20 percent lower risk for colon polyps, which can lead to colon cancer. Walking faster lowered the risk for both colon polyps and colon cancer.